Olive green paired with floral and black is the perfect combination. Both “tops” I have featured are actually shorter dresses being worn over skinny jeans. 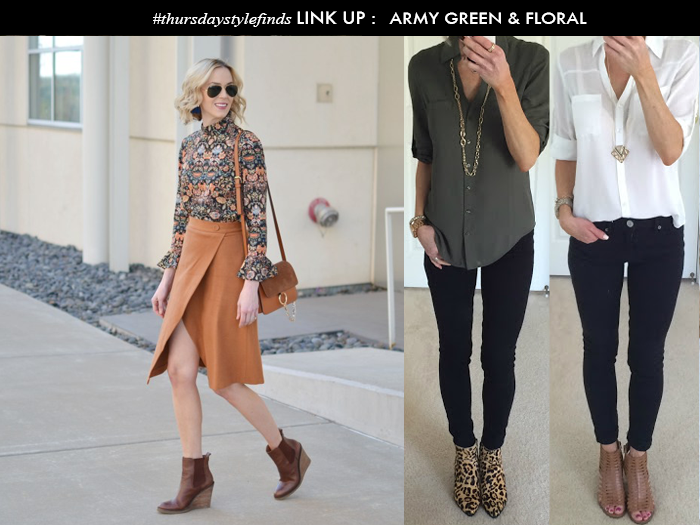 Thanks for joining me last week for my Thursday Style Finds. My outfit collage this week was inspired by my two picks from last week. The floral from Amy Ann’s (Straight A Style) and the olive green and black from Gina (On the Daily Express). Aw, thanks so much for the feature, Lisa! Funny, I was looking at your outfit set thinking "I would totally pair that military jacket with that top and those jeans." I'm flattered to have been part of the inspiration for your set! Thanks for the feature! I love olive green and floral. What a good combo! I like how you have been showing some longer "dresses" as tops. They are always short on me anyway, so it's nice to have some style options. Ohhh, loving the jewelry you are featuring this week! Also feeling inspired to mix my florals with army green now - thanks, Lisa. Great board, I love the long tunic with the skinny jeans! Oh loving the floral top with the army jacket. I just got a new army jacket this past week, can't wait to wear it! I love that floral shirt dress! That floral dress is just gorgeous! Great inspiration, I just remembered I have a similar floral sweater!! Love your picks and Amy has such a great style! this outfit is ridiculously awesome. I love the floral + olive! I need to try this, I have a lot of these pieces! Great look! I've never thought of pairing army green with florals. I love both looks! I would love to own that army green jacket. I love both looks! I can't wait until it's warmer and I can finally start wearing my army jacket! I love a good military jacket! Also I am obsessed with that bag! I love both looks! I'm going to have to mix my military jacket with floral and recreate this! In my opinion, it doesn't get much better than green - in any shade! 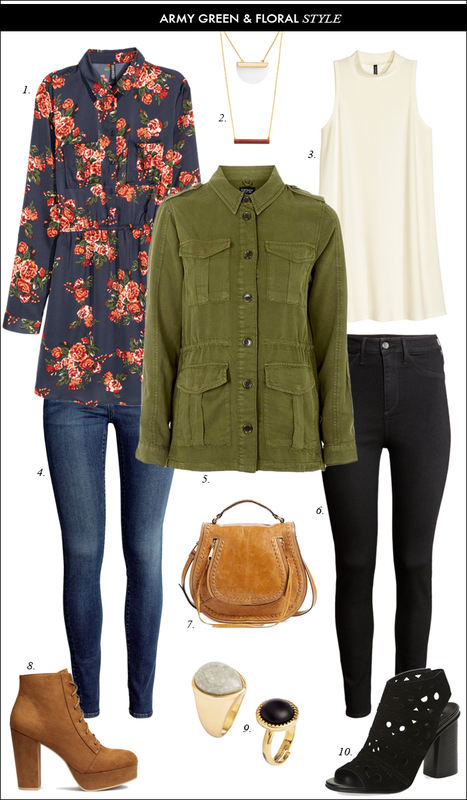 Love the contrast of the Army green cargo jacket and the feminine floral blouse. Fun! Great picks. I love the floral with the green. I am obsessed with military green right now. I also love it with lace. I want every pair of footwear in your collage.